LinkRay: Light ID technology improves on QR codes in signs and displays to let people point their phone or tablet camera at a projected image from any position that can see it and automatically download coupons, photos, menus, or other information from the cloud. ** Around this time, Panasonic indicates that the original light source brightness will have decreased to approximately 50%. Physical attributes. With the projector on a table and viewed from behind, all of the connectors are on the back panel in a slightly recessed area centered between the two exhaust vents. The power connector is at the bottom of the recessed area, just left of center. The Kensington lock slot is on the right of the area, roughly centered between top and bottom. The security bar is on the bottom edge of the back panel, near the right side. Intake vents are on the front and both sides. Low Brightness Mode. Both Eco and Quiet modes are about 68% as bright as Normal mode, which is still bright enough for many large rooms. Quiet mode lowers fan noise from the rated 35 dB to a rated 28 dB. Presentation Optimized Lumens. Although almost all of the MZ770U color presets deliver eye-catching, vibrant color for business graphics even with default settings, Natural offers the best balance of brightness and color accuracy for presentations, at 6069 lumens. That's bright enough to light up a 230-inch 1.0 gain screen in moderate ambient light. Most other modes show a slight green bias, the key exception being Blackboard mode, which has a red bias. For those modes with a green bias, the shift is so slight that without a reference image to compare with it is noticeable in only a small percentage of images--primarily those few photorealistic images that tend to show green easily in skin tones. As with most projectors, the brightest mode--Dynamic--has the most obvious green shift. However, even its shift is slight enough to make Dynamic with default settings more than acceptable for presentations if you need its high brightness to stand up to ambient light at the image size you want. Video Optimized Lumens. For film and video, Natural mode with default settings delivers highly watchable video with suitably neutral color. Zoom Lens Effect on Brightness. The standard lens curtails light by 24% at the full telephoto setting, which is in the typical range for a 1.7x zoom. For Dynamic color mode and Normal power, that translates to 5,852 ANSI lumens. Brightness Uniformity. At 87% brightness uniformity with the lens at its full wide angle setting and an only slightly lower 85% at the full telephoto end, it is possible to see some brightness variation in a solid white image if you look for it. However, the variation is exceedingly minor and impossible to see with any image--text, graphic, or photorealistic--that breaks up the field of view. Input Lag. The input lag in most preset modes is 41 to 42 ms. The exceptions are Cinema and Standard, at 48 ms.
On-board audio. The 10-watt mono speaker delivers enough volume to fill a mid-size room. Throw distance. The choice of six lenses offers a vast throw distance range, letting the MZ770U throw a 200" diagonal 16:10 image from almost anywhere between 11.1 feet and 101.7 feet. The Panasonic PT-MZ770U Projection Calculator will give you the throw distance range for the image size you want, including throw data for each of its optional lenses. Lens shift. The MZ770U's lens shift adds significant flexibility to placement. Vertical shift for the test unit measured +/-72% of the image height up or down from the centered position. The horizontal shift is roughly 30% of the image width left and right of the center line. The two shift ranges interact with each other, so each is 0 at the other's most extreme positions. High altitude mode. There is no high altitude mode per se. The MZ770U has built-in heat and pressure sensors that let it adjust fan speed as needed for altitudes as high as 8,858 feet. By any measure, the Panasonic PT-MZ770U is an impressive beast, and even more so for the price, at $7,499 with the standard lens as tested. 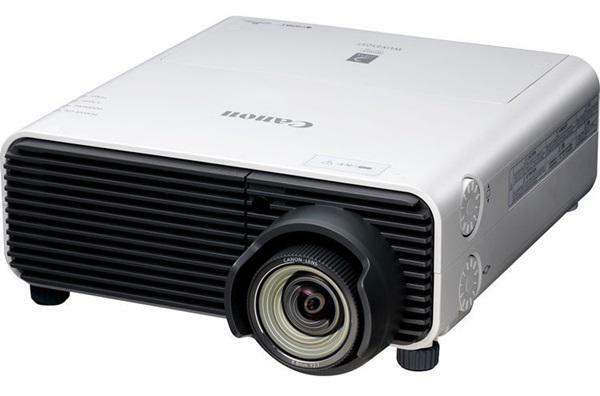 It is the least expensive projector on the planet today that combines 1920x1200 native resolution, a laser-phosphor-wheel light source, and an 8,000-lumen or higher brightness rating. It even costs less than some otherwise comparable 7,000-lumen projectors. And keep in mind that the test unit delivered higher than the rated brightness, at 8,275 lumens based on the center spot reading. It also measured 7,720 ANSI lumens. Colors in all predefined color modes are vibrant, nicely saturated, and eye catching for presentations. Natural color mode delivers both high brightness and suitably neutral color for video, making it a good choice both for presentations and for film and video in a museum, retail display, or sports bar. It helps too that the three-chip LCD design rules out any possibility of rainbow artifacts. At 6,069 lumens, Natural mode is bright enough for a 230" diagonal 16:10 image with a 1.0 screen in moderate ambient light. Brighter modes add a slight green bias with default settings, but not enough to notice with most images, and the higher brightness will stand up to a higher level of ambient light or larger image size. The MZ770U is also strong on setup conveniences. Its 37.7-pound weight is light for an 8,000-lumen, laser-based projector, making it easier to handle than most, while the choice of six lenses including the standard powered zoom lens (throw ratio 1.6 - 2.8:1), the large lens shift range, and 360-degree installation offers tremendous flexibility for setup. In addition, the laser-based, dust-resistant design makes the MZ770U an ideal solution when nearly maintenance-free operation is required. For displays in retail, museums, and sports bars, this can be critical. Displays signs and exhibits can also benefit from LinkRay, which can download anything from coupons to menus to descriptive text, to phones and tablets and even automatically download text in the default language specified by each visitor's device. Even in a classroom or conference room, this can be useful for providing ancillary material. The Panasonic PT-MZ770U's long list of features--including low price, high brightness, vibrant color, setup ease and flexibility, little-to-no maintenance, and extras like LinkRay--make it both unique and a sterling value. Whether for a classroom, boardroom, or small auditorium, or for a sign, display, or exhibit, the 8,000-lumen Panasonic PT-MZ770U will be hard to beat.